Martin Luther was a German monk. He thought that the Catholic Church had too much power and was corrupt. In 1517 he wrote a document called the Ninety-five Theses and nailed it on to the door of his local church. Luther set up a new, Protestant Church – the Lutheran Church. One of the differences between Protestants and Catholics is the way they view bread and wine during religious services. Catholics believe that the bread and wine actually turns into the body and blood of Christ. Protestants believe it stays bread and wine and only represents Christ. Luther also translated the Bible into German so more people could read and understand it. Luther’s ideas spread and were developed further. 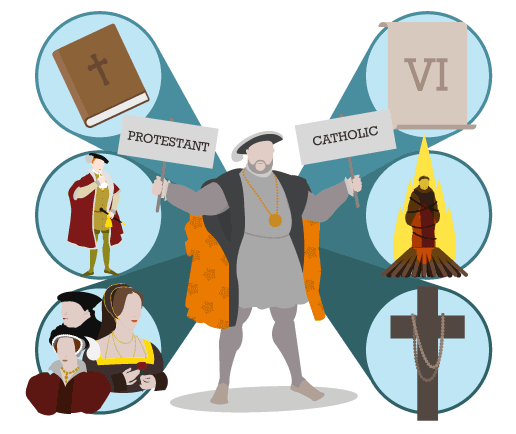 The Reformation in Europe led to revolution, war and persecution. It is against this background that you need to study religion in England in the Early Modern period. A stricter form of Protestantism called Calvinism became popular with the Dutch. In Scotland, Calvinism was called Presbyterianism. There were other, even more strict, versions of Protestantism. In England, very strict Protestants were called Puritans. There were wars of religion in France. First Spain and then France went to war against the Dutch Protestants. 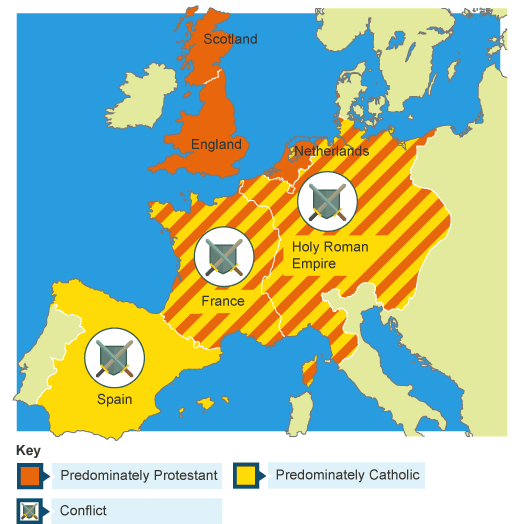 In Germany, Protestant and Catholic states fought the Thirty Years War (1618-48). In Spain, the kings used the Inquisition to torture and burn Protestants. Henry VIII broke away from the Catholic Church in Rome and closed the monasteries. To help him in his struggle with the Catholic Church, Henry needed help from Protestants. He split away from Rome because he wanted to divorce Catherine of Aragon and marry Anne Boleyn. The Act of Supremacy made him head of the Church in England. Both Thomas Cromwell (his Chancellor) and Thomas Cranmer (his Archbishop of Canterbury) were Protestants. He closed the monasteries to get their wealth. During Henry’s reign, Protestantism grew in England. Thomas Cromwell, Henry’s Chancellor and Anne Boleyn and Catherine Parr, two of Henry’s wives seem to have been Protestants. His son Edward had Protestant teachers and he was brought up as a Protestant. The Bible was translated into English (1539). Towards the end of his reign Henry passed the Six Articles (1539) which meant the Church remained Catholic. Protestants who denied the Catholic faith were persecuted and even burned. Despite being Head of the Church in England, Henry never became a Protestant himself. Edward VI was only a child when Henry died. He was brought up a Protestant, but most people in England were still Catholics. The country was ruled by ‘Protectors’ on his behalf. They passed laws – with Edward’s agreement – which made the Church Protestant. The Latin Mass was no longer used. A Book of Common Prayer was introduced. It was written in English. Priests were allowed to marry. Statues of the saints were removed, and pictures on church walls were whitewashed. Stone altars were taken out of churches and replaced by wooden communion tables. Ornaments such as candles and goblets were sold and stained glass windows were smashed. Catholics bishops were imprisoned in the Tower of London. Protestant missionaries were sent out round the country to tell people about the new beliefs. They gave people Bibles written in English. In 1549 there was a rebellion against the new prayer book in Devon and Cornwall. The rebellion was defeated. She restored the rule of the Pope. Cardinal Pole, the Pope’s adviser, was brought to England from Rome and made Archbishop of Canterbury. In 1554 the country was officially reunited with Rome and the Pope declared head of the Church. The Latin Mass and Bibles were brought back. The English prayer book was no longer used. Mary married Prince Philip of Spain, a devout and powerful Catholic. About 300 Protestants who would not accept Catholic beliefs were burned to death. The nursery rhyme Mary, Mary quite contrary is said by some to be about Mary Tudor, although there is no actual proof. ‘Silver bells and cockleshells’ were badges worn by pilgrims. The ‘pretty maids’ were the nuns she brought back to England. Historians disagree about the effect that Mary had on the country. In the past most historians believed that burning Protestants turned people against Catholicism. There was a rebellion in 1554 against the marriage to Philip of Spain, known as Wyatt’s rebellion. 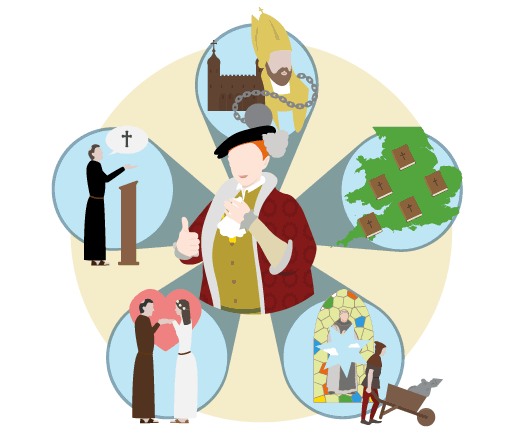 However, many modern historians think that England was only Protestant on the surface during the reign of Edward VI and that most English people were delighted to go back to the Catholic religion under Mary I. She called herself ‘Supreme Governor’, not ‘head’ of the Church of England. Church services and the Bible were in English. Many elements of Catholic services were allowed, including bishops, ordained priests, church decorations, music and colourful robes. The English prayer book was brought back, but a Latin edition was also printed. The new prayer book said that Christ was ‘really present’ in the bread and the wine in the Communion service. This was halfway between Catholicand Protestant beliefs. There was no question, however, that people could believe what they wanted. The Act of Uniformity (1559) stated that everybody had to attend the Church of England and use the Book of Common Prayer. She punished the Puritans and any Catholics who refused to go to Church of England services. These people were called recusants. Did Elizabeth change her ‘middle way’ policy? 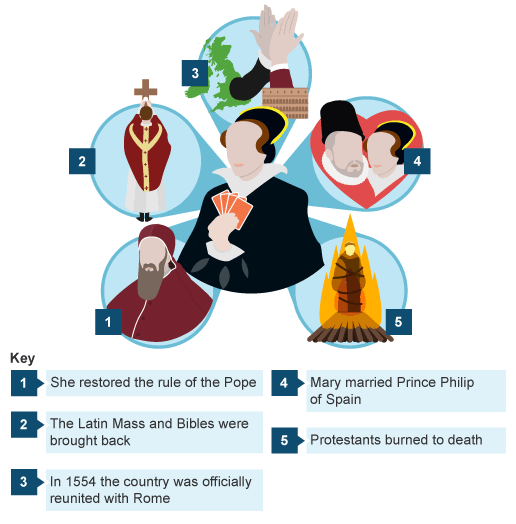 The Pope excommunicated Elizabeth in 1570. 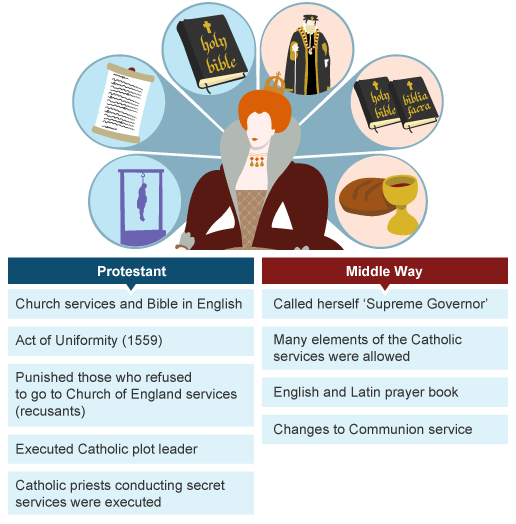 There were plots and rebellions against Elizabeth led by Catholics. The leaders of these were executed. Catholic priests who conducted secret services for Catholics were tortured and executed. Elizabeth executed as many Catholics as Mary burned Protestants. By the end of Elizabeth’s reign, England was a Protestant country. The failure of the Gunpowder Plot (1605) was greeted by national celebrations. Religion played an important role in the Civil War. Oliver Cromwell, in particular, was motivated by his Puritan religion. 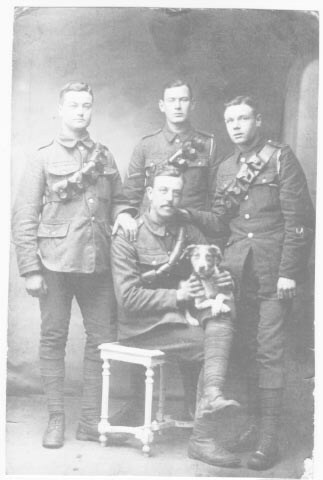 When he was Protector, he banned dancing, theatres, pubs, gambling, maypoles and even Christmas. The Glorious Revolution. Find out more in Britain’s Government Through Time. The wars against the Catholics in Ireland. The Act of Succession (1701) gave the throne to a Protestant German (George I). Catholics were prevented from taking the crown and no monarch could marry a Catholic.